An Excel 2007 file that I was working on recently became corrupted. The following are some things that I learnt in my process of recovering the file. I tried various recovery options that did not work: Recovery Toolbox, clicking the open and repair option in Excel; searching for auto save files in User - Application Data - Microsoft - Excel; I tried changing the file extension to ".xls", ".xlsm", "xlsx". Basically I kept getting the error message "Excel cannot open the file ... because the file format or the file extension is not valid. Verify that the file has not been corrupted and that the file extension matches the format of the file." Excel 2007 files (e.g., ".xlsx", ".xlsm") are in an XML format. If you change the file extension (i.e., "xlsx", "xlsm") to ".zip", you can unzip the Excel file and look at its components. JKP provides a helpful overview of the file format. The "xl" folder in the extracted zip file seemed to contain most of what I needed, although it was not arranged in a particularly accessible form. In particular, "sharedStrings.xml" had most of the cell content but in a disorganised form. "workbook.xml" had the workbook names and "tables\...xml" had the column names for my tables. If you drag and drop the "xml" files into Excel into the xl folder, you can open them as a table and have a look. Thus, with a little fiddling I was able to recreate my Excel file. My file was called "meta.xlsx"; this is what it looked like after converting to "meta.zip" and extracting the zip file. I was in similar situation a lot of times,but every times next software helped me-repair Excel file.It is free as far as I remember and can also extract information from corrupted Microsoft Excel files. Yes. I tried The Recovery Toolbox. It did not work in my case. The software publishers do allow you to trial it for free. I have had tremendous help with the 'zip' trick. Only one question left. I have been able to recover my excelsheet, except for the vbcode. I have found the vb code in the zip file as "vbaProject.bin". In what way can I retrieve the information of this "vbaProject.bin" file? I'm not sure. I am guessing that you have already tried to open the file in a text editor like Notepad? Hi jeromy... I have a problem alike... please help me... I dont know much about recovering files... I did download recovering tools but i still cannot open my excel file.. I need my excel file badly.. will you please help me so i can open it. It is simple excel i only need the data... please please... I will send you the file..
Then I only get very strange non-readable characters. found the solution. I have made a 'test' excelsheet with an ampty vb module. Renamed the .xlsm to .zip and acutally unzipped the file. Then I replaced the vbaProject.bin with my saved vbaProject.bin file I wanted to retrieve. YES I got my vb code back. my file wont even unzip. do you think you can help with this? (2) have you changed the file extension to zip. Perhaps, try asking the question on superuser.com explaining in detail your situation. Wow, I was desperately seeking a solution for my corrupted xlsm-File and I finally found a extremely successful surprisingly elegant way to resolve the problem for my seriously damaged workbook. It worked very fine for me. Thanks! my porblem: probably unplugged my USB drive without saving/exiting Excel. What i have now is a .xlsm file and its ~$ file. Excel complains about extension or corruption problem. RecoveryTB didnt help. unzipping file opens only several files in 2 folders + a corruption message. Any suggestion what to do from here? Ran into a similar problem when going from Office 2003 to Office 2007. To fix this, edit your Registry. You can either manually make the above entries or copy and paste the text into Notepad and save it using the ".reg" extension. 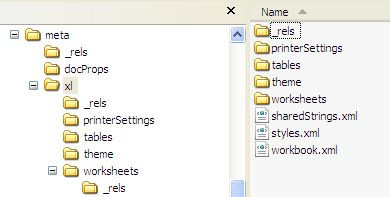 If you want to make a reg file make sure you leave a space between the first line, "Windows Registry Editor Version 5.00", and the next line, and place a space after the last line. To save your reg file, go to FILE | SAVE AS, browse to the place you want to save it and when you give it the name, enclose the name in quotes; e.g. "ExcelExtensionHardening.reg". Make sure to do all this in Notepad, not Word, WordPad, etc., as those programs will add things that will make the reg file useless, and could possiblly hose your entire OS. To apply your reg file, just double-click it. Regarding Emmo's problem with the VbaProject part, I use a tool called VbaDiff. It seems this app can read code straight out of the Excel file, so it's worth a try if anyone has a similar problem. This was genius and saved me a ton. Thank you !!! I don't know if this will help anyone else, but I had a .xlsx file which gave the "Excel cannot open the file because the file format or extension is not valid. Verify that the file has not been corrupted and that the file extension matches the format of the file" error in Excel 2007 SP2. The "Open and Repair" method did not work, and I could not save the file as a .zip extensions. What did work, however, was opening the file in OpenOffice and resaving as a different filename. Good luck! Same problem. Repair won't work. Unzipping works (kind of). I have tried to do all things mentioned above. Repair does not work, Opening as text provides only unreadable characters. Opening with OpenOffice provides about the same result as opening as text. Making it zip does not work. I have encountered this problem several times and I wonder whether I have any options left? All methods which are mentioned in the above post are excellent but I like second method most because it can be performed by any user very easily and repair excel file is quick time. Wrecked an xlsm file with libreoffice. Various tools downloaded did not help. BOUGHT (ARGH!!!) Excel. Changed the file extension from xlsm to xlsx and Excel was able to recover it, without the macros. I follow the steps, but I dont understand last step "If you drag and drop the "xml"...". I just can open workbook.xml and see the data. How can I open all xml files at the same time? 2. Open the zip file and right click on anything ... go "repair archive"
Yes, save the corrupted file .xlsm as .xls or .xlsx and then open it. Once it's back, save it back to .xlsm. It works for me. Thanks. I also have a corrupted test.xlsx file. I copied the file to another folder and than renamed it to test.xlsx.zip. When I extract it it tells me nothing to extract. the original and copied file shows size amount 0. I simply renamed file to .xls and it opened fine. I also just renamed the file to .xls and it worked. I had to use the command prompt to rename the file.